If I had to guess at this blog’s readership demographic, I’d imagine that the majority of readers work mainly in the .NET space and within the Microsoft technology ecosystem in general. My background is a bit more eclectic, and, before starting with C# and WPF full time in 2010, I spent a lot of years working with C++ and Java in Linux. As such, working with a Raspberry Pi is sort of like coming home in a way, and I thought I’d offer up some Linux goodness for any of you who are mainly .NET but interested in the Pi. 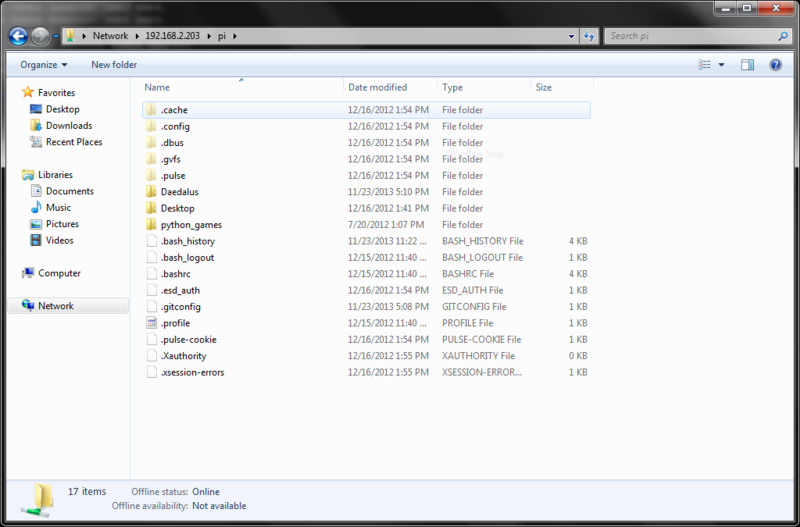 One thing that you’ve probably noticed is that working with files on the Pi is a bit of a hassle. Perhaps you use FTP and something like Filezilla to send files back and forth, or maybe you’ve gotten comfortable enough with the git command line in Linux to do things that way. But wouldn’t it be handy if you could simply navigate to the Pi’s files the way you would a shared drive in the Windows world? Well, good news — that’s what Samba is for. It allows your Linux machines to “speak Windows” when it comes to file shares. Here’s how to get it going on your Pi. This assumes that you’ve setup SSH already. SSH into your Raspberry Pi and type “sudo apt-get install samba” which will install samba. Type “y” and hit enter when the “are you sure” prompt comes up telling you how much disk space this will take. Next do a “sudo apt-get install samba-common-bin” to install a series of utilities and add-ons to the basic Samba offering that are going to make working with it way easier as you use it. Now, type “sudo nano /etc/samba/smb.conf” to edit, with elevated permissions, the newly installed samba configuration file. If you go navigate to your pi’s IP address (start, run, “\\piip”), you’ll see that it comes up but contains no folders. That’s because samba is running but you haven’t yet configured a share. Navigate to the line in the samba configuration file with the heading “[homes]” (line 244 at the time of this writing), and then find the setting underneath that says “browseable = no”. This configuration says that the home directories on the pi are not accessible. Change it to yes, save the config file, and observe that refreshing your file explorer window now shows a folder: “homes.” Cool! But don’t click on it because that won’t work yet. Now, go back and change that setting back under homes because we’re going to set up a share a different way for the Pi. I just wanted to show you how this worked. Instead of tweaking one that they provide by default, we’re going to create our own. Add the following to your smb.conf file, somewhere near the [homes] share. Here’s what this sets up. The name of the share is going to be “pi” and we’re specifying that it can be read, written, browsed. We’re also saying that guest is okay (anyone on the network can access it) and that anyone on the network can create files and directories. Just so you know, this is an extremely permissive share that would probably give your IT/security guy a coronary. Now, go refresh your explorer window on your Windows machine, and viola! If some of the changes you make to samba don’t seem to go through, you can always do “sudo service samba restart” to stop and restart samba to make sure your configuration changes take effect. That shouldn’t have been strictly necessary for this tutorial, but it’s handy to know and always a good first troubleshooting step if changes don’t seem to go through. And that’s it. You can now edit files on your Pi to your heart’s content from within Windows as well as drag-and-drop files to/from your Pi, just as you would with any Windows network share. Happy Pi-ing! I’ve recently throttled back on being all .NET all the time, mainly because I’m trying to spend more time working on my home automation. Toward that end, I recently picked up a Raspberry Pi. Since the organization’s home page neglects to include an elevator pitch as to what it actually is, I’ll summarize by saying that the Raspberry Pi (or RPi, for short) is a fully functional computer that’s about the size of a credit card and contains a good cross section of the device I/O that you might want, including audio, HDMI, USB, and ethernet. Oh, and they’re $35. I’d imagine that most of you reading have either heard of this or, if you haven’t, you’re thinking of half a dozen uses now that you’ve read my description. But if you aren’t, here are a few uses you might find attractive: tiny media PC, small robot controller, car OBD troubleshooter device, Roomba brainwasher (I totally want to do this and use it to chase my cats around). One could also use it, as I plan to, for home automation. My purpose here with my first RPi is going to be relatively simple — I’m going to offload the home automation controlling functionality of my home’s server onto it. The server I’m currently using is a repurposed dinosaur that I took with me to college (P2, 400 MHz processor, and tricked out to the max in slots with a whopping 3 128 MB sticks of RAM). It chugs along with an old Fedora installation, running a web server, SVN, a few databases, samba, and a few other goodies, as well as being hooked up to my big external drive where media is stored and eventually whisked into the cloud via Crash Plan. Add to this the fact that there’s a firecracker module plugged into its serial port to make the jump from my software to the electrical, and this is a pretty busy old machine that may not be long for this world. So I’d like gradually to parcel out its functionality to a handful of other machines to minimize my exposure to an extremely annoying failure, and the RPi is perfect, spec-wise and form-factor-wise, for the home automation web server. A micro-USB electronic device charger (i.e. an “anything but Apple” cell phone charger) to power the Pi. (Optional) HDMI to DVI adapter if you plan to spend a significant amount of time with your RPi plugged into a monitor. You can probably make it happen without most of these things, but this is what I was working with when I did it, so if you have a Mac or want a different Linux distro on your RPi, this isn’t the tutorial for you. First, download the zipped OS, “Raspbian Wheezy” for the RPi at this link, which will actually trigger the download. If that becomes defunct or you want to find it on your own, you can go to the RPi download site. Now that you have the OS, you need a means of putting it on the SD card. For that, you’ll need the Win32 Image writer (link triggers actual download of zip) or find the download yourself at their site. Plug your SD card into your SD reader/writer. Extract the contents of both of the zip files that you downloaded and launch the disk manager utility with administrator rights. If it takes a long time to load, there’s probably a driver issue with your SD card — that happened to me, but the fix was very specific to my hardware and is thus beyond the scope of this tutorial. 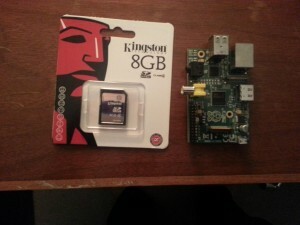 Choose the Wheezy-Raspbian img file and the drive in which your SD card is mounted on your computer (below). For me the only option was the drive with the SD card, but make sure you double check that it’s the right one — I don’t want to be responsible for your frying some drive you need with a Linux install. When you’re sure you’re not blowing anything you need away, click “Write,” and then click “OK” when warned. The write process will take a while, with specifics depending on your hardware. For me it took about 10 minutes. At the end, a “Write Successful” dialog will appear. Pop the SD card out of the computer and put it into the RPi. 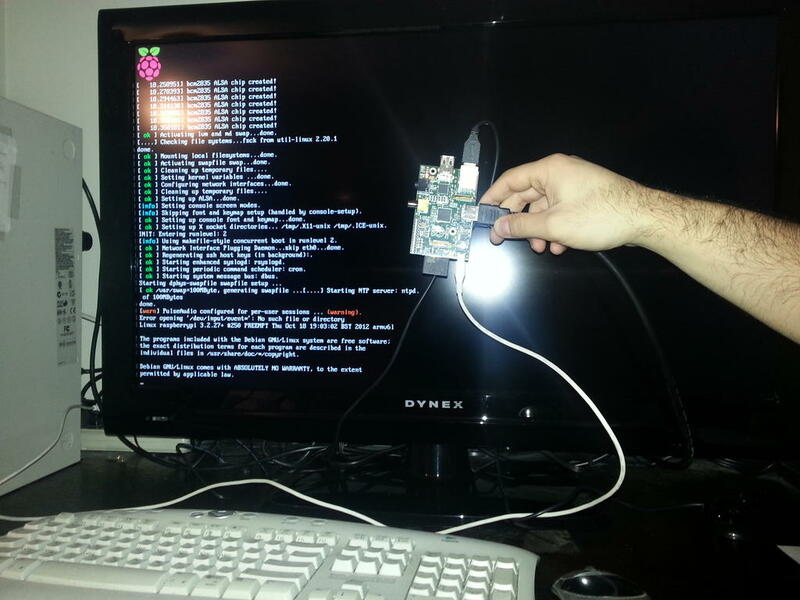 Plug your RPi’s HDMI into a TV (or monitor with the adapter) and plug a USB keyboard and mouse into the RPi. Once it boots up, you’ll be shown some initial configuration options. I enabled SSH and expanded the root partition to use my entire 8 Gig SD card. Your mileage may vary here, but I bought the SD card just for the Pi and I have no interest in leaving the Pi plugged into my bedroom TV on a permanent basis, preferring to remote in. I also enabled booting into desktop, though I may later get rid of that option since the Pi will be headless. From there I selected “Finish” and rebooted. This took a while since it resized the root partition on reboot. Once it booted, it booted to a cute little desktop with the RPi logo in the background and you can configure it like any other Linux distro. On the desktop, I noted that wheezy ships with WPA-supplicant for wifi config, which is handy if you have a wifi USB dongle, though I did not go this route — I have known much pain from using wpa_supplicant 5-6 years ago with AES before the utility was mature. After playing with the RPi desktop a bit, I powered down and disconnected from the TV, setting it up headless in my office, to be accessed via SSH. At this point, I tunneled in via SSH and ran an update. I had seen that things weren’t working on the desktop because it needed updating, so, first things first. “sudo apt-get update” did the trick (after about 4 or 5 minutes). To put apache on there, I did “sudo apt-get install apache2”. Ah, apt-get, the original app store. Finally, if you’re going to have a web server, it makes sense to give it a static IP. There’s nothing specific to Wheezy about this — it’s just standard Linux networking involving modifications to the network/interfaces file. And, viola! 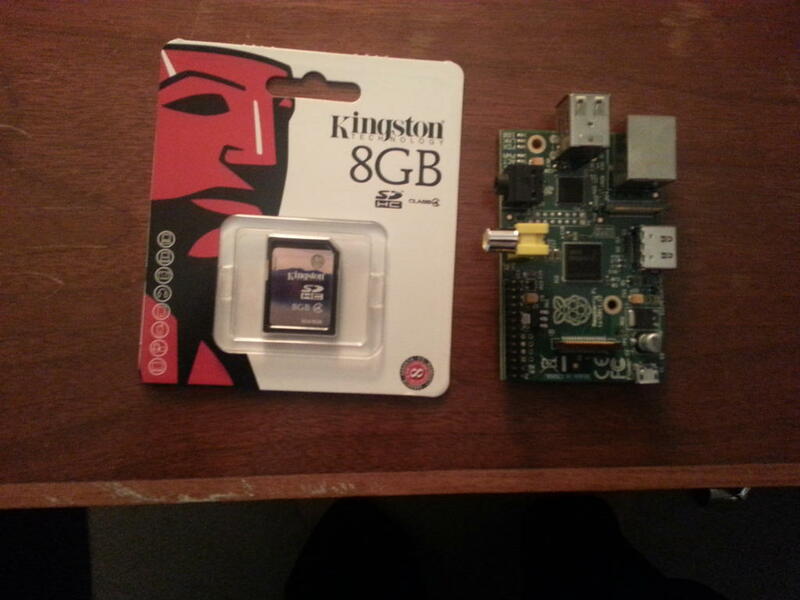 The transformation from RPi in the box it shipped in to little web server is complete.